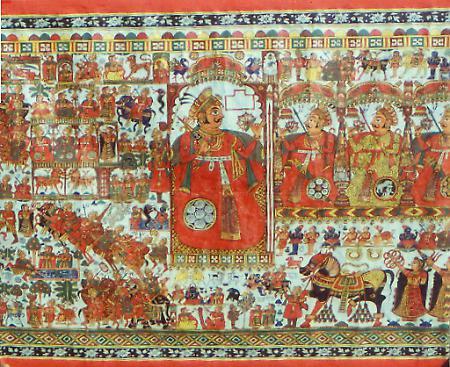 These cloth scroll-paintings in folk styles are known as phads and they depict the lives of local heroes. They tell the story of Pabuji Ramdevji and Dev Narainji whose exploits are sung by minstrels or bhopas in the villages. Vegetable colours are used on cloth and paper and historical themes are depicted. Vibrant colours and bold lines, along with a two-dimensional treatment of figures, and the entire composition arranged in sections, are characteristic of these paintings. Shahpura in Bhilwara and Udaipur are the main centres.